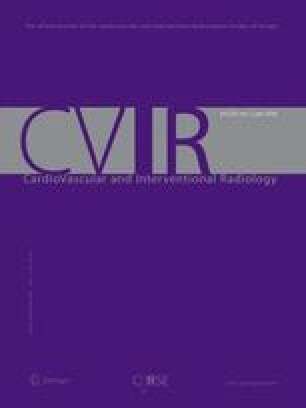 Purpose: Further development of a previously described interventional method for isolated liver perfusion (ILP) with a new double-lumen balloon catheter, and evaluation of the side-effects of such isolation. Methods: In six pigs a double-balloon occlusion catheter was placed via the transjugular approach with its tip in the portal vein. One of the balloons was positioned in the inferior vena cava (IVC), cranial to the origin of the hepatic veins and the other balloon in the portal vein. By the transfemoral approach, a single-balloon occlusion catheter was placed in the IVC caudal to the origin of the hepatic veins. A third catheter was placed by the transfemoral route with the occlusion balloon in the proper hepatic artery. After inflation of all balloons 99Tcm-labelled human serum albumin was recirculated through the liver. The isolation was evaluated by repeated measurement of radioactivity levels in peripheral blood. Laboratory tests of liver and pancreas function, and hemoglobin, were taken before, at the end of, and 3 days after the procedure. Blood gases were tested at the beginning and end of the procedure. Results: One pig died during the procedure due to technical failure and was excluded from the study. In the other pigs leakage from the isolated liver to the systemic circulation increased slowly, up to 9.7% (mean) during 30 min of recirculation of the perfusate through the liver. Laboratory tests were normal in all pigs except insignificant acidosis directly after the procedure and the slight elevation of s-ALAT after 3 days. Conclusions: Only minor leakage from the liver to the systemic circulation was noted during ILP performed with a new, double-balloon catheter. There were no serious side effects.